I've been trying to envision a scenario where global warming is accelerated to the fasted possible speed. One scenario I thought of was detonating large scale nuclear warheads on the North and South Poles, as well as Greenland. Russian media report that the missile will weigh up to 10 tons with the capacity to carry up to 10 tons of nuclear cargo. With that type of payload, it could deliver a blast some 2,000 times more powerful than the bombs dropped on Hiroshima and Nagasaki. Note: the goal is to melt all the ice on Earth as quickly as possible, so some alterating of the above parameters is acceptable. The best solution is to not nuke the poles. The poles are really-really-really big. The arctic ice sheet is around 20000km$^3$ of ice, or 20000000000000m$^3$! That's 1.8334 × 10$^1$$^6$ kilograms of ice. Melting ice takes 333.55 kJ/kg, so we'll need about 6,100,000,000 TJ of energy to melt it all. The RS-28 you reference is believed to be able to deliver a 50Mt warhead. That outputs 209 TJ of TNT. Thus, if you lobbed 10,000 of these, their combined output (2,090,000 TJ) would melt about 0.034% of the ice in the pole. On the other hand, nuclear war's most terrifying outcome is nuclear winter. Less than a hundred nuclear events is considered sufficient to send the planet into a catastrophic nuclear winter. Your nukes are more likely to have the opposite effect of what you intended! Frankly, its' good to remember our old friend Order of Magnitude (Energy). Planetary scale energies are... special. It's astonishing how small we are. If only glaziers melted down ocean levels will not go higher , because since the ice is floating on water , if it melted it will be the volume it took from water when it was floating. But if all the ice melted on land , that will really be a problem . If nukes hit tomorrow, Maldives will go under the sea in few weeks . And most of the islands will not be able to survive. But the temperature will not go up that fast. 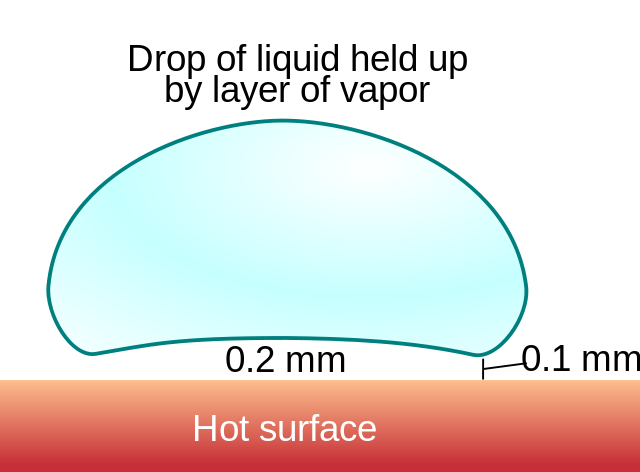 Nukes can't destroy all the ice , ice has this heat repellent quality which makes it a bit hard to melt supplying direct heat.that is called Leidenfrost effect . But ice will shatter around and it will float in the sea creating a thin layer of ice. So this layer of ice will not go away that easily and it will cover the dark , heat absorbing sea . Nuking the ice will not make the sea level go up that much . And global warming will not go up as fast as the person who nuked the ice thought. Launching and exploding nuclear warheads in the arctic weathers wouldn't really dislodge much ice or land, and would actually cool the Earth. This phenomenon is known as a nuclear winter, and although is a misnomer regarding firestorms after a nuclear or other such event, by simulating volcanic eruptions that release dust, soot, and other particles into the air following a nuclear explosion, we can simulate the effects. Luckily, it's already been done for us. As you can see in 1945 (Hiroshima and Nagasaki), the average temperature went down when compared to the war years in which industry in numerous countries rose. Essentially by removing firestorms, you're making an artificial and radioactive volcano in an area not only devoid of life, but flammable materials. See here for the effects of volcanoes on climate. Honestly, the best way to speed up global warming would be to increase the population. As has already been shown, there's no point nuking the ice. Assuming you still want the ice to melt, your best bet is to darken the ice. If you coat it with a layer of dust, ash or other general pollution it will absorb more heat and give you a greater summer melt. 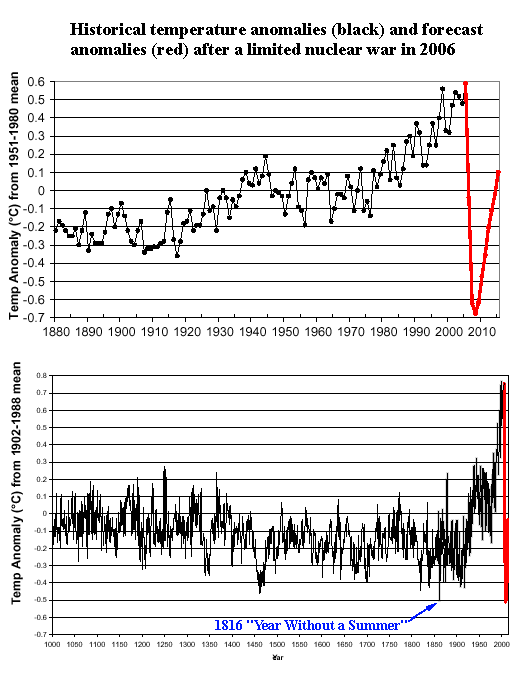 This trend toward darker snow from soot and dirt has been observed for years. Sources vary from dust blowing off deserts and snow-free Arctic land, to soot from power plants, forest fires, and wood-burning stoves. But now soot and dust are taking a greater toll, according to a report released this week, causing Greenland's ice sheets to darken—and melt—at a faster rate in spring than before 2009. Not the answer you're looking for? Browse other questions tagged science-based nuclear climate-change nuclear-weapons or ask your own question. Could nuking the poles of exoplanets or planets in the solar system be an effective method of terraforming them?